In 2018, the Winter Olympics head to PyeongChang, a county in South Korea. The area is located in the Taebaek Mountains and is known for its world-class ski resorts, making it an ideal spot for the winter games. 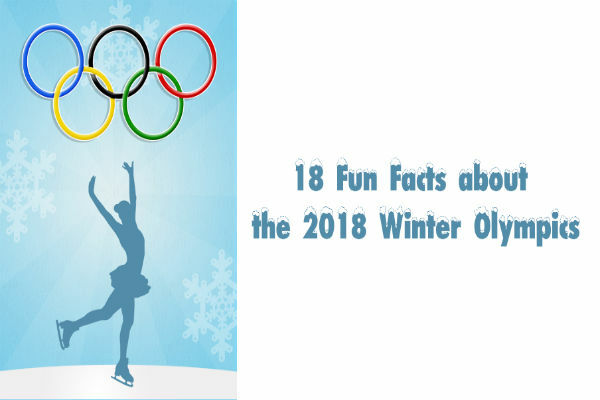 Read on to discover some fun facts about the games themselves and the athletes competing this year. 1. The mascot of the Olympics is a white tiger named Soohorang. The white tiger is a common figure in Korean folk tales. The “White Tigers” is also the nickname of South Korea’s most elite battalion. 2. The emblem for the games is comprised of shapes that make up the consonants in the word PyeongChang when written in Hangul, the Korean alphabet. The alphabet is unique because it is used to represent individual letters and those letters can be arranged to represent different syllables. 3. The medals that will be awarded to athletes were designed to represent tree trunks. PyeongChang is known for its mountain forests, but ironically an entire forest was destroyed to create a ski run for the games. If you could design a medal, what would it look like? 4. The fabric from which the medals hang is a South Korean fabric called gapsa. It is a lightweight, sheer fabric. For the games, the fabric has been embroidered with Korean symbols. 5. There are six new events at the 2018 PyeongChang games. They include: a Nations Team Event for alpine skiing, big air men’s and women’s snowboarding, mass start men’s and women’s speed skating, and mixed doubles curling. 6. There are more female and mixed events than at any other Olympics in history. 7. Norway has won the most medals at the Winter Olympic Games. The 329 medals won by Norwegians include 118 gold meals. The United States has won the second-largest number of medals with 282, including 96 gold. Track the medals won during this year’s game to see if Norway stays in the lead. 8. There are a record 102 medal events during these Olympic games. 259 sets of medals have been cast for the games. 9. Due to a doping scandal, Russia has been banned from competing in the 2018 Winter Olympic Games. Athletes from Russia may still compete, but they must do so as individuals, not as part of a country and cannot wear any uniforms that represent Russia. 10. South Korea and North Korea have experienced a tense relationship for many years and an area near the border between the two countries has been off-limits to people. However, this area will be opened up for Olympic athletes to travel through. 11. Although there is a small airport near PyeongChang, athletes attending the games will likely fly in and out of Incheon Airport in Seoul. A high-speed train line was built to help people travel from the airport to PyeongChang in under two hours. 12. The last two Winter Olympic Games have been fairly warm, with outdoor competitors landing in puddles and skiing on man-made snow. However, the games in PyeongChang are expected to be very cold (the wind chill makes it feel like it is in the single digits) and there will be plenty of natural snow. 13. Athletes and spectators will have to brave the cold to sit in the open-air Olympic stadium. The stadium cost around $107 million to build and is scheduled to be torn down after the games. 14. For the first time, National Hockey League members, who include some of the greatest hockey players in the world, are not going to participate in the Winter Olympics. League officials did not want to pause their regularly scheduled season to allow athletes to participate. 15. Maame Biney made history by becoming the first African-American woman to qualify for the U.S. short track speedskating team. She is only 17 years old. Another 17-year-old, Chloe Kim, is favored to win gold in snowboarding. 16. There are multiple sets of siblings set to compete in the Winter Games. They include ice dancing duo Maia and Alex Shibutani; ice hockey players Hannah and Marissa Brandt; and curlers Becca and Matt Hamilton. 17. Six nations are also scheduled to compete in the Winter Olympics for the first time: Ecuador, Eritrea, Kosovo, Malaysia, Nigeria and Singapore. Other nations, such as France, Austria, and Germany considered not attending the games because of the tensions between North and South Korea. However, they have since agreed to attend. 18. 92 nations, including athletes from Russia who will be competing under the International Olympic Committee flag, will be represented that 2018 Winter Olympic Games. Who are you cheering for during this year’s Winter Olympic Games? Help kids get excited by researching the athletes who will be competing at the games and completing fun Olympic worksheets. The total solar eclipse of 2017 may have captured the astronomical spotlight last year, but 2018 brings a cluster of stellar events worth viewing as well. This year, encourage kids to head outside and look to the sky. Here are some not-to-miss celestial events to watch with kids in 2018 along with easy ways to incorporate them into your curriculum. The phrase “once in a blue moon” describes something that happens rarely, but a blue moon is actually not as rare as you might think. On January 31, 2018, you can actually view a blue moon for the first time since 2015. A blue moon is the second full moon in a month, an event that normally occurs only about once every two and a half years. As a bonus, there will be a second blue moon this year on March 31, leaving February without a full moon. Not only will there be blue moon on January 31, but there will also be a supermoon and a lunar eclipse! Supermoons can occur several times a year when the full moon coincides with its closest approach to Earth in its orbit. Add to that a lunar eclipse, sometimes called a blood moon because of the moon’s reddish tinge, and you have a trio of reasons to encourage kids to observe the moon on January 31. The Super Blue Blood Moon offers a perfect real-world event for studying cyclic patterns of the Earth-sun-moon system. Prepare students ahead of time by having them watch NASA’s video, A Supermoon Trilogy, and completing our lessons on Lunar Phases and Lunar Eclipses. Mars is the headliner for 2018 space events. From books to movies, there may be no planet that captures our imaginations quite like Mars. On July 27, Mars will be in opposition, making it fully illuminated by the sun. In addition, it will be the closest to Earth it has been since 2003. Other than the moon and Venus, Mars will be the brightest object in the night sky. Kids will have to wait until 2035 to see Mars this closeup again. Then again, maybe they will be the generation to first step foot on the Red Planet! Use this space event as an opportunity to connect astronomy with literary skills. Elementary students can work on creative writing with this One-Way Ticket to Mars writing prompt. Our Earth vs. Mars reading passage will get middle school students contemplating the challenges of living on Mars. Introduce high school students to the Elements of Science Fiction with this video lesson, and then have them read and analyze a work of science fiction. Try Ray Bradbury’s classic book, The Martian Chronicles, or Andy Weir’s contemporary work, The Martian (the classroom version is edited for language and includes discussion questions and activities). Get the kids to bundle up and head outside on December 16, for a special viewing of Comet 46P/Wirtanen. There is a chance this comet, which orbits the sun every 5.4 years, will be viewable with the unaided eye. A basic pair of binoculars should offer enough magnification to catch a good view of this “dirty snowball” as it passes Earth at its closest point. However, should the weather not cooperate on December 16, there is still plenty of opportunity to spot the comet as it should be viewable for most of December. Use the video, Close Approach Comets, to introduce students to 46P and our Solar System lesson to give them an overview of how comets fit into the solar system. Then, have kids build model comets before heading out to do some real-world comet spotting! These are some of the most astronomical events for 2018. 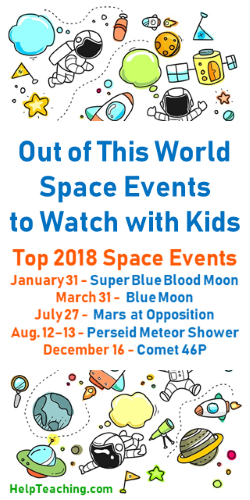 The year is sure to bring other out of this world reasons to head outside and view the cosmos with kids. Of course, astronomy is always accessible simply by enjoying the wonders of stargazing on a clear night! Looking more science teaching resources? Visit Help Teaching and browse our astronomy worksheets and online science lessons or read our Ultimate Guide to Teaching Science. Geography Awareness Week, also known as GeoWeek, is celebrated every year during the third week of November. The goal of the week is to get people excited about geography and help them learn more about the world around them. Every year, we present fun facts to help you get excited about Geography Awareness Week. This year is no exception. 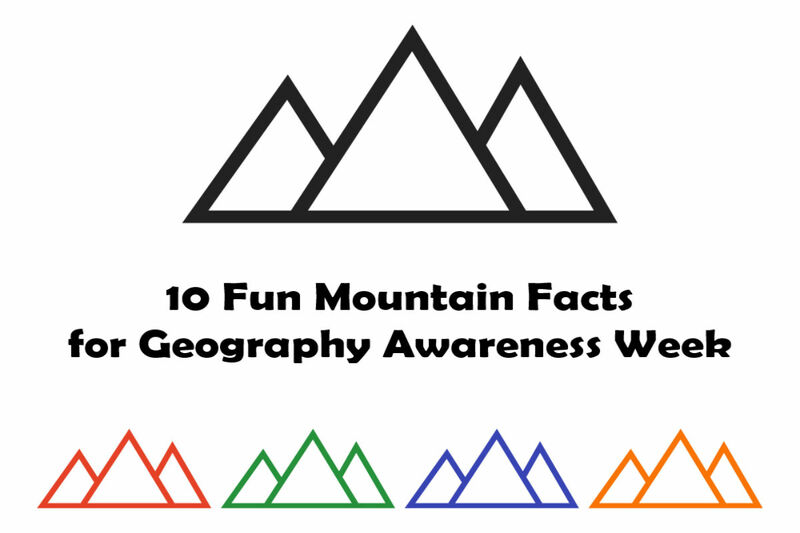 In honor of Geography Awareness Week, we have rounded up 10 fun facts about one of the most majestic and awe-inspiring geographical features on Earth – mountains! Did you know that there are no universally agreed upon rules for what makes a mountain a mountain? The general agreement is that a mountain is a landform that is taller than the surrounding area and bigger than a hill. Of course, there is also no agreed upon definition of a hill either. Because there is not an official definition of a mountain, countries define what a mountain is in different ways. For example, Ireland and the United Kingdom require a mountain to be over two thousand feet tall to be considered a mountain, while the United States has determined that mountains only have to be over one thousand feet tall. This means that a mountain in one country might be considered a hill in another. Mountains are found all over the world. Each of the seven continents have its own maintains. Here are some fun facts about the mountains on each of the continents. The Appalachians are over 480 million years old. They were formed during the Ordovician period when the North American plate crashed into another plate during the creation of the super-continent of Pangaea. Once as tall as the Rocky Mountains, the Appalachians have been worn down over the many millions of years to the low peaks seen today. The Andes extend over forty three hundred miles through Venezuela, Ecuador, Peru, Bolivia, Chile, and Argentina. The mountains were pushed up when to the Nazca and Antarctic plates started slipping under the South American Plate. The highest volcanoes in the world, and the highest mountains outside of Asia, are located the Andes mountain range. With over ten mountains over 8000 meters tall, the Himalayas are the tallest mountains in the world. Mount Everest, with an elevation over twenty nine thousand feet, is officially the tallest mountain in the world and is located in the Himalayas. There is, though, some dispute over whether or not Mount Everest is actually the tallest mountain. Mountain height is measured by how high the peak of a mountain is above sea level, not how tall the slopes of the mountain are. The base of Mount Everest sits in the Tibetan Plateau, which is over thirteen thousand feet above sea level, meaning that the slopes are around fifteen thousand feet. Denali in Alaska, on the other hand, has a base that is less than three thousand feet above sea level and slopes that are almost nineteen thousand feet. The mountains are also only about 70 million years old, which means that they are also among the world’s youngest mountains. The Indian continental plate moves sixty-seven millimeters per year, which means that that the Himalayas are growing, albeit very slowly, each year. Mount Kilimanjaro in Tanzania is a volcano that is not part of any mountain range. The mountain has three distinct volcanic cones, two of which are extinct, but the third is only dormant and could erupt again at some point. It is unclear when Mt. Kilimanjaro last erupted, but it is suspected to have been during the 19th century. Because of its height, Mount Kilimanjaro is one of the only mountains in Africa to have a permanent snowcap. Not every continent has tall mountains. Mount Wycheproof in Australia is officially the smallest mountain in the world. To most of the world Mount Wycheproof would barely be considered a hill. The mountain measures in at a staggering 486 ft above sea level. You would have to stack up almost sixty Mount Wycheproofs to reach the height of Mount Everest. Though it is impossible to accurately verify, residents of the town of Zermatt, Switzerland claim that the nearby Matterhorn is the most photographed mountain in the world. Even if it is not the world’s most photographed mountain, the Matterhorn is an extremely popular tourist attraction and its image has become a symbol of Switzerland. Did you know that even Antarctica has mountains? They might not be the highest or the longest mountains in the world, but the Gamburtsev Mountains are the only mountains that are completely covered with snow. No one has actually seen the mountains because they are currently buried under two thousand feet of snow and ice. From 2007 to 2009, scientists used ice penetrating radar to survey mountain range. From their findings it has been determined that the mountains probably are around 6,500 feet tall and resemble the Alps in Europe. Do you have any fun mountain facts to share? If so, share them in the comments. For more fun geography facts, check out 10 Fun Facts for Geography Awareness Week and 10 More Fun Facts for Geography Awareness Week, and be sure to check back next year for even more facts! Click on the image for a printable version of the Solar Eclipse Map. A total solar eclipse is perhaps one of the most dramatic astronomical events we may witness during our lifetimes. On August 21, 2017, all of North America, as well as parts of South America, Africa, and Europe will experience either a total or partial solar eclipse. 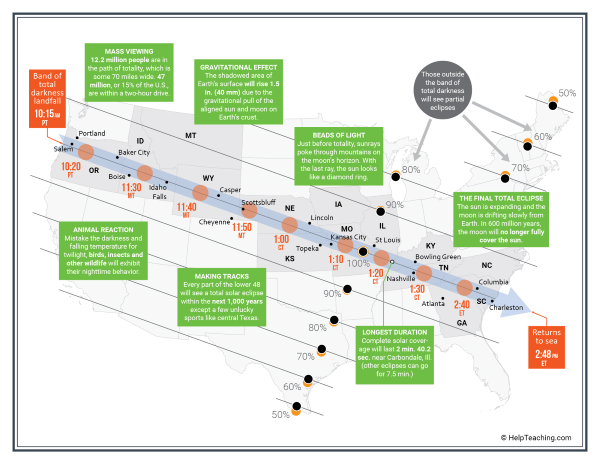 Our printable solar eclipse map shows when and where you can plan on viewing the eclipse in the United States. Here are ten facts to know about this summer’s solar eclipse before heading out with your kids to view this astronomical event. 1. People in fourteen states will experience a total solar eclipse. 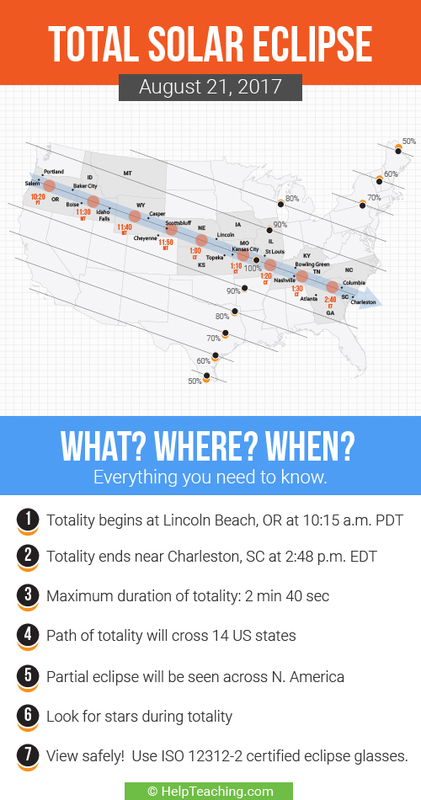 The path of the total eclipse will trail from Oregon southeast to South Carolina. The rest of North America will experience a partial solar eclipse. 2. Totality is the maximum amount of time the moon completely blocks the sun. The location with the longest duration of totality will be near Carbondale, Illinois, and will last about 2 minutes 40 seconds. 3. The duration of the eclipse will depend upon your location. In most places, the time of first contact, from when the moon first begins to cross the sun, until fourth contact, when it completes the eclipse, lasts two to three hours. 4. During a solar eclipse, the moon aligns perfectly between Earth and the sun. Since the moon’s orbit around Earth is slightly tilted compared to Earth’s orbit, solar eclipses do not occur every month. Our online Solar Eclipse lesson introduces students to the science of eclipses. 5. Although the diameter of the sun is much larger than the diameter of the moon, from Earth, they appear to be the same size. The moon is much closer to Earth and is located at the exact distance needed to completely block the sun during a total eclipse. 6. The moon blocks the bright photosphere of the sun during a total solar eclipse. During totality, the corona, or dim outermost part of the sun’s atmosphere, can be seen. 7. The only time you can safely view a solar eclipse without eye protection is during totality. Discuss eye safety with children ahead of time and purchase certified ellipse glasses (not the same as regular sunglasses!). Learn more about ellipse eye safety at NASA.gov. 8. Subtle and not so subtle natural changes can be observed during a solar eclipse. The sky darkens. Air temperature decreases. The stars come out. It has even been reported that animal behavior changes as it would as nighttime falls. Changes will be most dramatic along the path of totality. 9. People have observed solar eclipses throughout human history. Yet, the narrow and seemingly random path of the moon’s shadow across Earth’s surface made it difficult for early astronomers to predict when the next solar eclipse would occur. It’s no wonder ancient cultures considered solar eclipses to be foreboding events. Our worksheet, What Causes a Solar Eclipse?, explores a few of the ancient explanations about solar eclipses. 10. The next total solar eclipse in the continental United States will occur on April 8, 2024. The next time a total solar eclipse will cross the U.S. from coast-to-coast will not be until August 12, 2045. 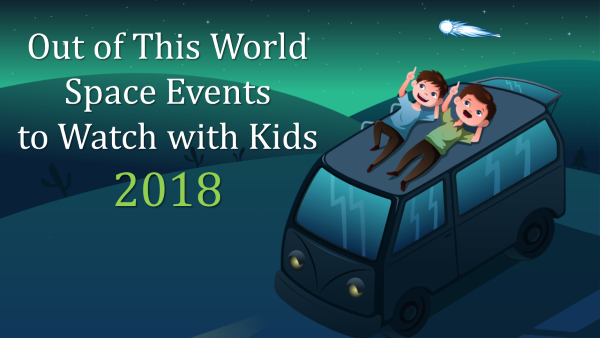 There are many ways to enjoy this spectacular celestial event with your children. Plan a solar eclipse party with friends, make a pinhole camera, or participate in an eclipse citizen science project. 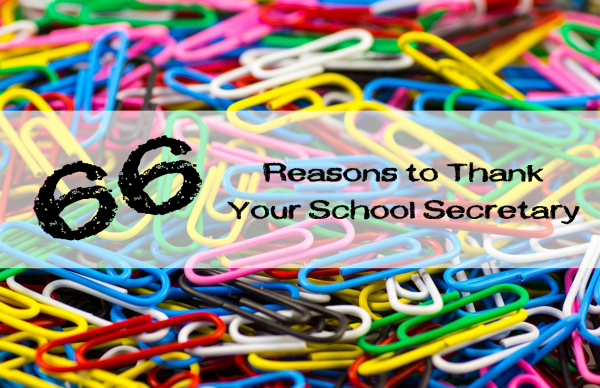 Looking for more fun ways learn about space with your students? Read 5 Stellar Activities for World Space Week or try our astronomy lessons and worksheets.